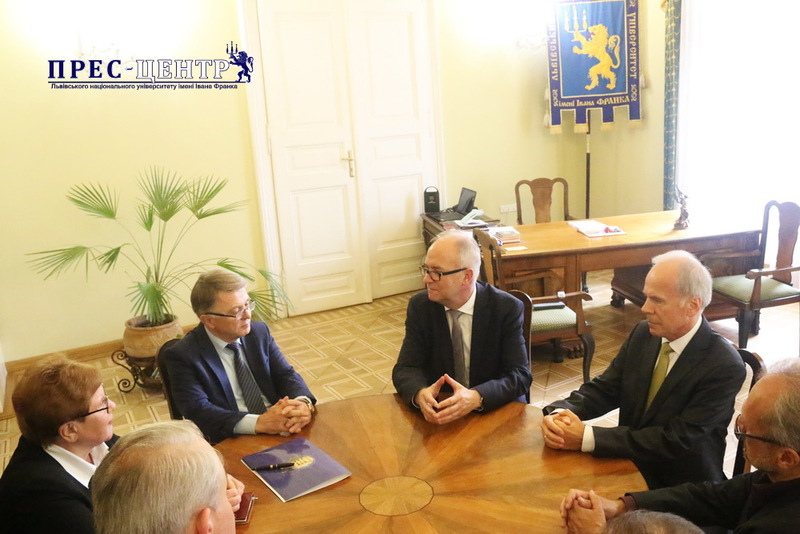 On October 6, 2017 the Rector of the University of Gdańsk (Poland) Jerzy Gwizdała and the Dean of the Faculty of Management of one of the largest universities in Poland, Professor Mirosław Szreder visited the Ivan Franko National University of Lviv. The main purpose of their visit was to deepen academic cooperation between the leading higher educational institutions of Ukraine and Poland and to inform about the structure, research priorities and principles of work at the University of Gdańsk. During the meeting with the Rector of Lviv University, Professor Volodymyr Melnyk, Vice Rector for Research, Teaching and International Cooperation Mariya Zubrytska, Dean of the Faculty of Economics Rostyslav Mykhailyshyn, Dean of the Faculty of Financial and Business Management Andriy Stasyshyn and Head of the Research and Development Department Yuriy Plevachuk, the Rector of the Polish University Jerzy Gwizdała emphasized that cooperation with Lviv University is important to the University of Gdańsk and expressed the hope for its positive results in the near future. “Our university is developing very rapidly and therefore it is extremely important for us to launch specific projects and initiatives from which both educational institutions will benefit,” said Jerzy Gwizdała. The Rector of the Ivan Franko National University of Lviv, Professor Volodymyr Melnyk expressed his gratitude to Polish counterparts for their interest in research conducted at Lviv University and pointed out that he would facilitate and support interaction between scientists and students of both higher educational establishments. What is more, as part of his visit to Lviv, the Dean of the Faculty of Management of the University of Gdansk, Professor Mirosław Szreder delivered a lecture to the students and staff of Lviv University, during which he spoke about the structure, research priorities and other features of one of the largest higher educational institutions in Poland.